The 9. SS-Panzergrenadier-Division Hohenstaufen was a German Waffen SS Armoured division which saw action on both the Eastern and Western fronts during the later years of World War 2, including the Ukraine, Normandy, Holland, Ardennes, Hungary and finally Austria. The division was formed in February 1943 and commanded by SS-Obergruppenführer Wilhelm Bittrich. In October 1943, Hohenstaufen was promoted to full panzer division status. The division was initially formed with young German RAD (Reich Labour Corps) conscripts with a cadre of experienced “Leibstandarte SS Adolf Hitler” officers, NCOs’ and training staff; further reinforced with ethnic German conscripts, many from Hungary. Their first action was in March 1944, when after arriving in the Ukraine the division became part of the II SS-Panzer Corps and sent into the attack near the town of Tarnopol to support the link up with the encircled 1st Panzer Army. After heavy fighting in terrible conditions caused by the rasputitsa (“mud season”), the division effected a link-up with Hube’s forces near the town of Buczacz. During these battles, Hohenstaufen had suffered many casualties, and in late April was pulled out of the line to refit. The II SS Panzer Corps was to act as reserve for Army Group North Ukraine, performing “fire brigade” duties for the Army Group. After the Allied invasion of northern France on 6 June 1944, the II SS Panzer Corps, including the Hohenstaufen, was sent to Normandy on 12 June, to defend Caen and soon became involved in the heavy fighting around Caen, Hill 121 and Falaise pocket. After the retreat from France, the 9th SS Hohenstaufen were moved to Arnhem in September 1944, to rest and refit and then became involved in the allied airborne assault at Arnhem, Holland. Their next action was the German advance in the Ardennes in the winter of 1944–1945, more commonly known as the “Battle of the Bulge”. After defeat in the Ardennes, the division was moved to Hungary, where it took part in the fighting to the west of Budapest in February and March 1945. Falling back into Austria, the division finally surrendered at Steyr to the advancing United States Army on 5 May 1945. 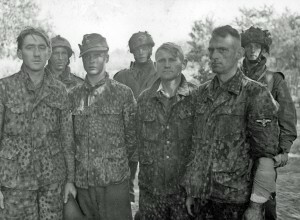 The four prisoners are from the SS-Panzer-Aufklärungs-Abteilung 9/9.SS-Panzer-Division “Hohenstaufen”, shortly before being handed over to the Military Police. They were captured during Viktor Gräbner’s ill-fated attempt to rush through the British defences around Arnhem Bridge on the morning of Monday, 18th September 1944 – one is a seventeen years old. (Ref: Bridge Too Far – below). 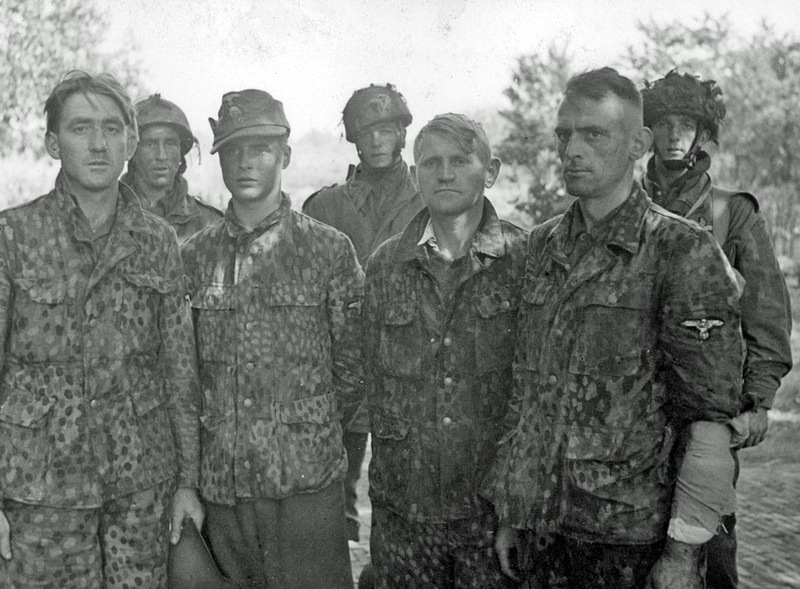 All of them are wearing the pea dot 44 camouflage pattern (SS-Erbsenmuster) that were peculiar to the Waffen SS. The three guards in the background are glider pilots, from left to right, Staff Sergeants Joe Kitchener, “Duffy” Edwards, and George Milburn. Perhaps, many military historians have become aware of 9th SS Hohenstaufen from the 1977 film “A Bridge Too Far”, when the spectacular battle scene recreated the true story of a battalion of 9th SS Hohenstaufen led by Hauptsturmführer Gräbner storming the Arnhem Bridge, which was fiercely defended by British paratroopers. Gräbner was informed from radio messages that evening about enemy paratroopers having captured the northern end of the Arnhem bridge. Leaving behind a few of his vehicles from his unit at the town of Elst, Gelderland, midway between Arnhem and Nijmegen, he traveled during the night north towards Arnhem to take it upon himself to clear the area around Arnhem bridge of whatever paratroopers where there. At 9:30 a.m. on the morning of 18 September, Hauptsturmführer Gräbner ordered his battalion, numbering about 22 armoured cars, half-tracks and a few trucks with infantry, to assault the bridge. The first five German armoured cars of the column managed to make it across the bridge unscathed due to the fact that they took the defenders by surprise. The British had laid mines on the bridge’s approaches and these were expertly avoided by the speeding German drivers. In the resultant two-hour battle, the battalion was beaten back with heavy losses and forced to retreat back to Elst where it played no further role in the fighting around Arnhem. Of the 22 armoured vehicles that were involved in the assault, 12 were destroyed or knocked out and over 70 men killed, including Gräbner who was killed in action during the assault. Information about the ceasefire arranged by the senior medical officer of 1st Airborne Division, Graeme Warrack, with his counterpart, Dr Egon Skalka and the Divisional HQ of “Hohenstaufen” for the evacuation of British wounded from the perimeter to German hospitals.